Yes indeed, Mark. The church as we know it today will be divided off once again. The false converts will be driven back to the world whilst the Bride will be driven to the brink of death. Only those who have been marked by the Holy Spirit will survive. Mark, that is by far one of the best quotes I’ve seen to date that says so much in few words, that adequately describes the poor state the American Church is in today. May the Lord help the true Church within the American Church stand strong when persecution comes. Weeding time is just around the corner for the American Church. The false converts will be exposed for who they are, and the true converts will be held up by the Lord’s righteous right hand. May God help us all. Not only does the world hate us Jn. 15: 18-19 but the apostate church will persecute us with the same self righteous zeal as Saul of Tarsus once did. Christ wasn’t crucified because He was popular. He was an irritant to the highest degree. It’s like shining a spotlight down a dark alley. The homeless will strive very hard to turn it off. Ravenhill never left people wondering what he really meant. 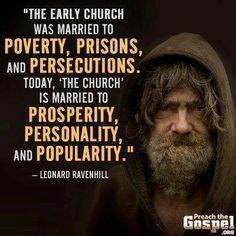 We need more clear, full-throated prophetic voices like Ravenhill, Tozer and Spurgeon speaking the truth in love to the backslidden church in our day.